Never judge a book by its cover. That’s one age-old English idiom which isn’t applicable to the art of Islamic bookbinding. The book covers crafted during the Islamic civilisation were more than just protectors of Holy Scriptures — they were windows to the world of Islamic civilizations which placed a high value on knowledge, art, craftsmanship and progress. The Islamic Bookbinding exhibition at the Islamic Arts Museum Malaysia (IAMM), which runs till Dec 31 this year, offers us a glimpse into the rich heritage of book bindery, a craft cultivated across the Mamluk, Safavid, Qajar and Ottoman dynasties. The exhibition is divided into three sections: the history and types of bookbinding form one portion, designs and techniques cover the second, while the last portion showcases the elements that are involved in bookbinding. “We wanted to make it easier for visitors to navigate the exhibition, because there’s so much to take in,” explains Amira Salleh, who along with Zahra Khademi is the project manager for the exhibition. “Sometimes we come down here to observe the visitors,” she tells me with a grin. “And we see them getting really close to the book bindings with wonder and surprise in their eyes and expressions,” Zahra chips in with a chuckle. The reactions of visitors to one of IAMM’s most extensive exhibitions are unsurprising considering they have over 70 exhibits on display ranging from the early periods of Islamic dynasties to the 19th century Islamic world. Historically, the spread of Islam is attributed to the dissemination of the Quran, the holy scripture of Islam. As the senior conservator of the British Library, David Jacob notes that the art of Islamic bookbinding came about as a necessity to keep written records of Prophet Muhammad’s teachings. “With the spread of Islam, there was a concern among believers that it was no longer possible to depend on just memory and oral transmissions to spread the word of the Quran — there was an urgent need to record the Quran in a clear and tangible form that left no margin for doubt, amendment or error,” he says. Considered the most sacred text, it wasn’t surprising that the covers of the Holy Book grew into an artform. Bookbinding in the Islamic world, as Amira shares, is the final process of putting manuscripts together. “It is basically a cover to protect manuscripts. It’s also the final element of a bigger process which is book-making,” she shares, pointing to a big diagram on the wall as visitors enter the gallery. The illustration explains the different components used in bookbinding, with an emphasis on the flap of the book — a distinctive feature only found in Islamic bookbinding. The flap held a multi- functional role — to protect and preserve the pages or to be used as a bookmark. “One of the philosophies of Islamic art is that functionality precedes aesthetics,” explains Amira, who points out that every exhibit in IAMM is a functional object. As the Islamic world expanded, different materials and techniques were introduced to make the covers more elaborate. A cross-pollination of cultures was also very apparent in the designs — in the Arab world leather was the material of choice, lacquer with gold leaf floral filigree motifs were distinctively Persian while the Malay manuscripts used textiles ornamented with motifs mirroring local vegetation. 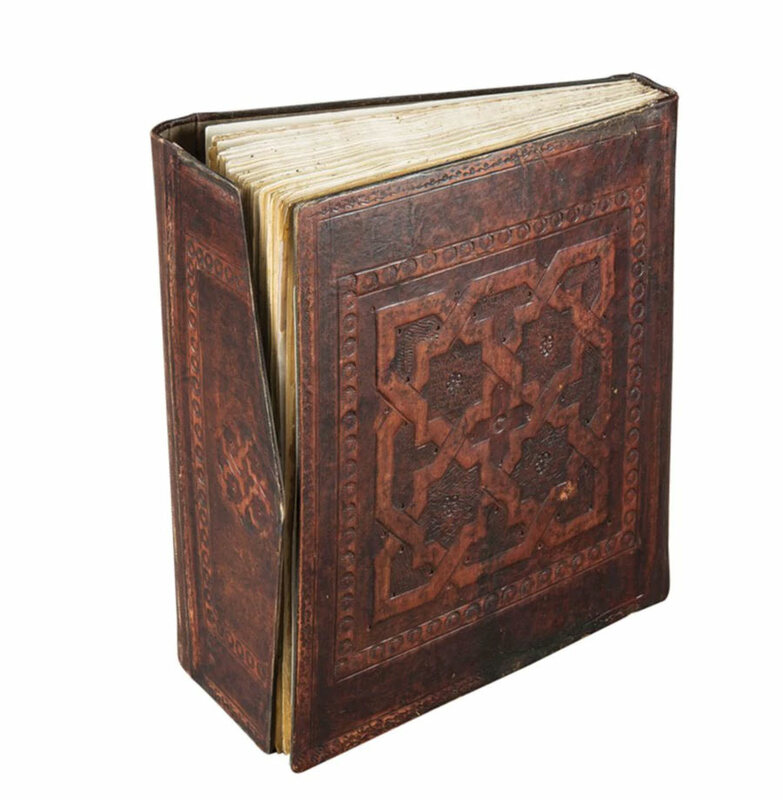 “Bookbinding gives us an insight of where the exhibits stood in the timeline of Islamic history. The art of book covers reflect many things — the way people lived, what flora and fauna inspired them and the kind of influences craftsmen borrowed or brought with them,” shares Zahra. In Hijaz, an area of the Arabian Peninsula where Islamic bookbinding was believed to have started in 7AD, craftsmen used sewing techniques to bind goat skin and texts written on parchment paper. “It was an incredibly time-consuming art form. Bookbinders would use up to 50,000 tools to make book covers,” explains Zahra, referring to the stamped leather binding method. Later, during the Mamluk Empire in Egypt, Andaluc?a and North Africa, bookbinders were heavily influenced by the techniques and artistry of the Coptic Christians. It was also during this period where craftsmen discovered how gold could be used on leather. However, it was the Persians who introduced the element of lacquer to book covers. For Zahra, this form of bookbinding showcases prestige in the art form. “Islamic bookbinding isn’t just about religious text. During the Qajar Dynasty, literature and depictions of history were also recorded in writings or in paintings,” she shares as we approach the section dedicated to the old pre-Islamic Iranian dynasty. This section, as both curators reveal, is somewhat different from the rest — it’s the only section where humans and animals were depicted on the front covers. “This was how folk stories were conveyed,” Zahra continues. But when Islam spread to Iran, manuscripts with religious text did not portray humans or animals, strictly out of respect for the religion. “Bookbinding also reflected the patronage of the arts,” Amira chips in, explaining that royal courts often commissioned master craftsmen to portray them on covers. “It was a very skilled job, so usually only the wealthy could afford these craftsmen.” In fact, bookbinding became so distinguished an art form that the rulers of the Ottoman Empire brought in the best book binders and artists from Herat, Tabriz, Cairo and Damascus to work in royal courts. For Amira and Zahra, working on the project for more than a year made them realise just how deep and incredible the art form is. “Bookbinding forms very much a part of our culture and our identity,” says Zahra, who feels this is just the tip of the iceberg.